Thanksgiving dinner calls out for a nice, soft dinner roll. Sadly, many folks who lavish attention on their turkeys, dressings, and eggplant casseroles have given up on homemade bread–some for so long that the factory-made brown-n-serve roll is part of holiday tradition. Well, I say it’s high time to return to homemade rolls. Soft, white dinner rolls are dead easy to make with a stand mixer, take very little active time, and require just 20 minutes or so in the oven. Plus, King Arthur Flour’s “White Bread 101” recipe is every bit as soft and fluffly as storebought, only cheaper and preservative- and chemical-free. Won’t you please try to just say NO to the brown-n-serves this holiday season? Here’s the recipe, from page 198 of the King Arthur Flour’s Baker’s Companion cookbook. The measuring, mixing, and kneading take about 12-15 minutes. Next, the dough sits all by itself for an hour. Then, you pinch off pieces of dough and shape into rolls–maybe 10 minutes, if you’re really slow. The second rise is another hour, unattended. Finally, the baking takes just 20 minutes. Dump everything into the bowl of your stand mixer. Using the dough hook, stir on low until all of the flour is moistened, then increase the speed to medium (#4) and knead until the dough looks smooth (5-7 minutes). Stop the mixer and pinch off a small piece of dough. Stretch it between your fingertips; if it tears quickly, knead for a few minutes more. When the gluten is properly developed, the dough will stretch easily into a paperthin sheet or windowpane between your fingers. Plop the kneaded dough into an oiled bowl (spray with cooking spray, or spread a little olive oil or butter on the bowl with your fingers). Drape a clean dishtowel over the bowl (better for the environment than plastic wrap, and your great-grammaw did it this way, too) and ignore it for an hour while it rises. Come back a little while later and grease a rectangular pan with sides (a pan with sides is important, if you want the soft, white sides and rounded, browned tops of real dinner rolls). Pinch off hunks of risen dough and roll into balls on the palms of your hands. 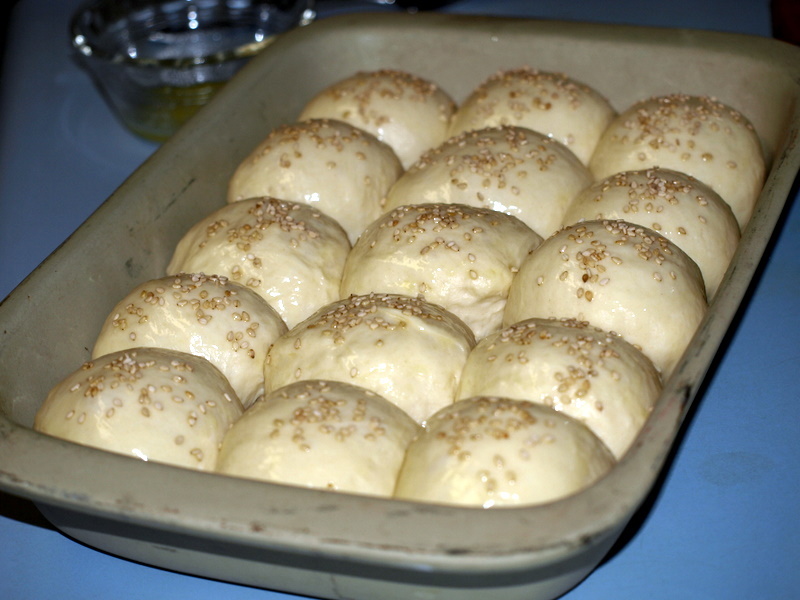 Plop the dough balls into rows in the pan, evenly spaced without touching. Try to make all of the balls the same size–if you didn’t eyeball it very well, you can squish off pieces of the fat rolls and add it to the runty ones. Cover with the clean dishtowel and ignore for another hour. The rolls will rise and swell into each other. Heat the oven to 350 degrees; while the oven heats, brush the tops of the rolls with melted butter (for a lightly crunchy crust) or an egg wash (for a shiny, thicker crust). The egg wash will hold a sprinkle of sesame or poppy seeds or salt flakes. Bake for 20 minutes, or until the crust is deep golden brown. If you have a probe thermometer, the internal temp needs to reach 190 degrees. Now, see, that wasn’t so hard! Without a stand mixer, kneading by hand will take 10-15 minutes. Dry potato flakes and nonfat dry milk will keep for months in the refrigerator. Buy a small box of both and you’ll be ready to make rolls any time the mood strikes.